On paper, it was still a lopsided loss in a Class 4A-5A matchup. But there were plenty of positives the Lady Bulldog basketball team was able to take away from their 58-35 loss to Carlsbad Friday at Bulldog Pit. The Lady ‘Dogs struggled through contests abbreviated by the 35-point mercy-rule clock in both of their previous meetings with the Cavegirls. 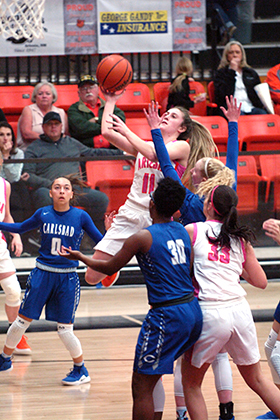 Unfortunately, they were hampered by single-digit scoring in both the first and second quarters, but the Artesia girls battled back in the third to best Carlsbad 13-9 and maintained their aggressiveness through the final horn. “I thought we played three pretty good quarters,” head coach Jeff Houghtaling said Saturday. “The first quarter was rough, but overall, we had a much-improved game against them. Carlsbad’s Carsyn Boswell kicked off Friday’s contest with a trio of three-pointers as the Cavegirls sank the first six baskets they attempted in the contest. With Baylee Molina and Tori Flores adding treys of their own, the Lady ‘Dogs found themselves in an early hole, 23-8. Carlsbad switched their damage-doing to the point as the second quarter began, with post Kaliyah Montoya posting three consecutive buckets, and following a shot off the glass by Elliot Harrison, Artesia would not score again until the two-minute mark on an offensive putback by Paityn Houghtaling. Houghtaling would stop and pop a three with five seconds to go in the half to send the Lady Bulldogs to the locker room down 35-15. Makinli Taylor posted a three and a free throw in the early goings of the third, and an old-fashioned three-point play from Harrison and Kyrah Gonzales trey showed improvement from the field by the Lady ‘Dogs, with Estrella Villa closing out the quarter with a jumper that made it 44-28. Carlsbad opened the fourth, however, with an 8-2 run as Artesia’s scoring dropped back into single digits through the final eight minutes en route to the 58-35 loss. Houghtaling finished with nine points for Artesia, followed by Taylor with eight. Boswell led all scorers with 25 for Carlsbad. Houghtaling says while the losses the team has suffered this season to 5A opponents have been tough to swallow, the challenges are only serving to make the Lady Bulldogs a better team as they begin to set their sights on district play. “I think we’re getting better at understanding that if you get a little behind, you have to keep fighting, especially if it’s early in the first quarter. There’s a lot of game left; you can’t throw in the towel. The idea is that these tough games are going to prepare us for district, and I certainly think we’re getting better. The Lady ‘Dogs (11-7) will now head to Clovis Tuesday for a 5:30 p.m. game against the Lady Wildcats before returning to the Pit at 7 p.m. Friday against Roswell High. “This is just more preparation for us,” Houghtaling said, “and it will be a really good couple of games for us going into district, because Clovis is going to be a little closer to how Portales is going to play us, and Roswell High will be probably more like how Goddard will play us.